At the back of her grandmother’s closet lies a mystery. After her grandmother’s death, Eva finds a series of diaries detailing the life of a girl caught up in the magic of the Roaring Twenties. She cannot reconcile the young woman in these diaries with the miserable old woman she loved so fiercely. What happened to change her grandmother so drastically? Eva is desperate to know more about this period in her grandmother’s life. What is the light of the world, and who is the mysterious girl that her grandmother fell in love with? Eva starts to investigate the puzzle her grandmother left behind. With the help of a local historian and his enigmatic assistant Olivia, they find a forgotten labyrinth under the city streets. But they are not the only ones down there. Someone else is searching for the light of the world. This novel is surprisingly hopeful for a book that opens on a funereal, that of Eva Kessler’s grandmother. Exposition is dropped in hints, and we learn that Eva is a college dropout, a survivor of mental illness, and one of the few people who was able to love her stubborn, difficult grandmother. The aforementioned mental illness was portrayed in a refreshingly explicit way, however Eva’s mother’s reaction to it was a bit cliched, and I disliked how Eva’s depression was continuously talked about instead of experienced. Eva’s depression dishonestly never hindered the plot—the book would say she would not be able to move for days at a time, but this never seemed to occur in the view of the reader. But redeemingly, the protagonist is clever and quick of wit, as is the author. The book is a bit slow to get going, but once the story begins in earnest two stories unfold in parallel—that of Eva, and that of her grandmother—as the supernatural mystery at the center at the novel is explored. The ominous foreshadowing was a bit heavy at some points, detracting from any twists the story wanted to surprise the reader with. I did feel like some parts of the mystery were never really answered, but the ending was mostly satisfying. In a story of fate, the ending wraps up expectedly but refreshingly for different reasons then you would expect. I loved the vaguely unsettling yet entirely captivating atmosphere of this book. The symbolism and foreshadowing were a bit heavy-handed, making the end of the novel fairly easy to predict early on, but it was an interesting read regardless. The characters were charming and relatable, and I really loved the symmetry between past and present in the narrative, especially as seen through Eva’s grandmother’s journal entries, which added a unique layer to the narrative. While refreshing to see discussed so candidly, the depiction of Eva’s fight with depression was a bit unrealistic, talked about more in the abstract than as an actual experience. The discussions about depression and mental illness felt a touch forced, but again, I really appreciate that the topic was brought up at all. Overall, definitely a book worth reading: an enjoyable story, charming characters, and refreshing moments of candid discussion of sexuality, race, and mental illness. I am a big fan of this book! I really loved the main character, and felt deeply for her every time her struggles with her mother came up. The book was slow to start, I agree, but once it got going I could barely put it down. I loved the grandmother’s story so much, I found myself hanging on to every line written about it. The fantasy element was also spot on, even if many of the mysteries of the light were glossed over or left out. But it just made me want to know more. Definitely give this book a try. I’ll start by saying that I really enjoyed this book. To me the characters were heartfelt and charming, the plot was engaging, and many passages were wonderfully lyrical. At its heart Light of the World is a book that explores puzzles. There is of course the overarching mystery of Eva’s grandmother as detailed in the book description. However, beyond that arc the book explores several interpersonal puzzles as well. 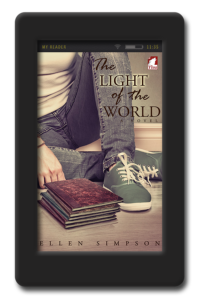 The varying mysteries of family, friends, love and adulthood are explored and navigated by Eva in her journey to learn more about her grandmother, and I think Light is much richer for it. One particularly interesting aspect was the narrative gave me pieces of the mystery that the characters Eva and her grandmother Mary didn’t have. To me it created a very engaging tension for me as the reader as I tried to pull my pieces of the puzzle together with the pieces that the characters discovered through their exploration. I think most of all I enjoyed Eva’s daily life and exploration of the puzzle of adulthood, family, and love. Simpson very handily captures one’s ability to simultaneously love and be infuriated by one’s family. I have read few things that have encapsulated my own complex feelings toward my loved ones as Light so perfectly does. Beyond the puzzles I very much enjoyed the author’s ability to create turns of phrase that are vivid and lyrical. My favorite passage “She has pulled open my ribs and settled herself right beside my heart, nestled in against my soul and I do not think I could ever carve her out,” is indicative of Simpsons talent and storytelling ability as these passages are written not just for the joy of language but also serve narratively as well. Such lyrical passages often show the similar traits that Eva and her grandmother have in common and as such help to emphasize the parallels that Eva’s own story has to her grandmother’s. Overall, definitely an enjoyable book that I recommend to anyone in the mood for a light mystery. Note: I received a copy of this book from Ylva in exchange for an honest review. I like to refrain from giving a synopsis or summary. I rather share my observations and feelings. The book was incredibly engaging. I wanted to ignore all my responsibilities of my own life to stay in Eva’s and Mary’s worlds. Just as Eva who couldn’t let go of Mary’s diaries. From the first page on I was intrigued and captivated. Eva has a unique voice. Although the relationship to her parents is similar to many other protagonists I have encountered in other works it doesn’t feel stale or derivative. Eva’s interest in men and women alike is well presented. It is a vital part of the story but not a major theme or “issue”. The delicate way in which depression and people’s reactions to it get explored and treated is amazing. Simpson captured what it feels like to cope and never be healed from that particular mental illness. At times the passing of time felt off. I cannot put my finger on it exactly, but some scenes read like minutes after the previous one but where meant to have happened days later. Picturing the environment the characters inhabited was incredibly easy because of the detailed descriptions, which at no point became overwhelming. The novel is a must read. It can be read by YA and “regular” adults.